Even though we’re 10 months past the compliance date, CMS keeps sending me ICD-10 updates. They’re promoting “official coding resources that can help you maintain your ICD-10 progress.” I’m not sure exactly how one wouldn’t maintain their ICD-10 progress unless (a) they started seeing workers’ compensation patients that are still billed under ICD-9; (b) they started a cash practice; (c) they just came back to work after an extended sabbatical; or (d) some other extenuating circumstance. The links direct back to the ICD-10 home page, which is topped by a February blog post by Andy Slavitt. Current events, indeed. The email did feature these funny icons and the first thing that popped into my head looking at the bottom one was “Sergeant Swaddle.” Between that and the baby bump one, I think they need a better graphic designer. 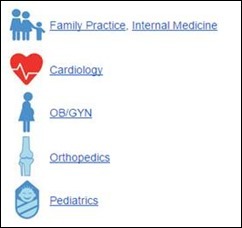 In other news, CMS announced the regions for its Comprehensive Primary Care Plus (CPC+) initiative and opened the application cycle for practices that would like to participate. CPC+ starts in January 2017 and is a five-year primary care medical home model. Up to 5,000 practices will be selected (2,500 in each of two tracks) to participate. Fourteen regions were announced including some full states. They were selected based on “payer alignment and market density to ensure that CPC+ practices have sufficient payer supports to make fundamental changes in their primary care delivery.” A list of payers that have been provisionally selected to partner is found within the FAQ document. CMS has definitely been busy this week, also releasing a proposed rule that expands bundled payments into the realm of cardiac care. It also extends the current bundled payment model for hip replacements to include other hip surgeries. The cardiac elements aim to increase the utilization of cardiac rehabilitation services, which have been shown to lead to better patient outcomes. CMS isn’t the only government agency that’s been busy, though. The US Department of Agriculture will fund distance learning and telemedicine projects in 32 states, helping rural communities to connect with medical and substance abuse experts. USDA will award more than $23 million in grants to support 45 distance learning projects and 36 telemedicine projects. Eligible applicants include: most state and local governmental entities; federally-recognized Tribes; non-profits; for-profit businesses; and “consortia of eligible entities.” Sounds like pretty much everyone is fair game. A colleague forwarded me an article describing an observational study that appears to show “no overall negative association” of EHR implementation on short-term inpatient mortality, adverse safety events, or readmissions. It looked at the Medicare population across 17 hospitals that had go-live dates during the observation period compared to 399 control hospitals. It just came out this week so it only has one comment on it, which interestingly comes from a physician practicing in the United Arab Emirates. Federal statistical agencies use the Standard Occupational Classification SOC) code system to classify workers into occupational categories. I learned from an AMIA blast this week that there’s finally a code for many of us: Health Information Technology, Health Information Management, and Health Informatics Specialists and Analysts. Right now it’s just a proposal which will hopefully be released for use beginning in 2018. I had to make a last-minute trip this week to replace a subcontractor who flaked out on me. It was bad enough that my entire week was going to be disrupted, but even more, I wasn’t thrilled about the $1,000 airfare, nor was I thrilled about having a Monday morning flight. The TSA recommendation for my airport right now is to arrive at least two hours early. The travel gods must have been smiling on me at least a little bit because I arrived at the airport to find exactly no one in the TSA pre-check line. It was a beautiful thing, even though I ended up with a flight delay. My client was cool about the last-minute substitution. It turns out that she only sees patients until 2 p.m. each day. After that, the office becomes a ghost town, so I’ve been able to keep up with other client engagements and even made it to the beach briefly. There’s something about having sand between your toes to rejuvenate you. What gives you a little boost? Email me.